As you might know (if you are my regular blog reader), I bought an iPhone 4 White for my wife on the first day of launch in Singapore, so she has handed down the 3GS to me. I finally get to use an iPhone in great depths. Apple iOS (iPhone, iPad) and Android OS are not new in the market, and you can find loads of review and comparisons. Many consumer forums are also fervently discussing the merits and disadvantages of each OS. In this post, I would like to give a more experiential take on this topic, one that is hopefully easier for my peers to make a decision between the two as the wave of new Android (and very attractive indeed) devices come to market in 2011. 1. whether your usage activity is mainly active-seeking information or passive-receiving information. 2. whether you like to control the storage or like to consume data without concern about managing the storage. 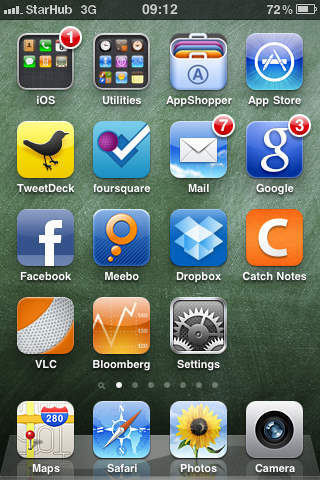 The iPhone is undoubtedly the OS with the most number of apps in the market. Putting game apps aside, fashion labels, publications, even community forums create apps so that you can easily access information of them. The iOS interface is sleek and very responsive, making the information you seek appear on the phone almost real time. You don’t feel a moment of lag as there is always something displaying on the screen. In this respect, Android OS might perform less consistently (performance might vary with different Android phone models and the processor speeds). Animations to keep the user occupied as iPhone plans its next step. 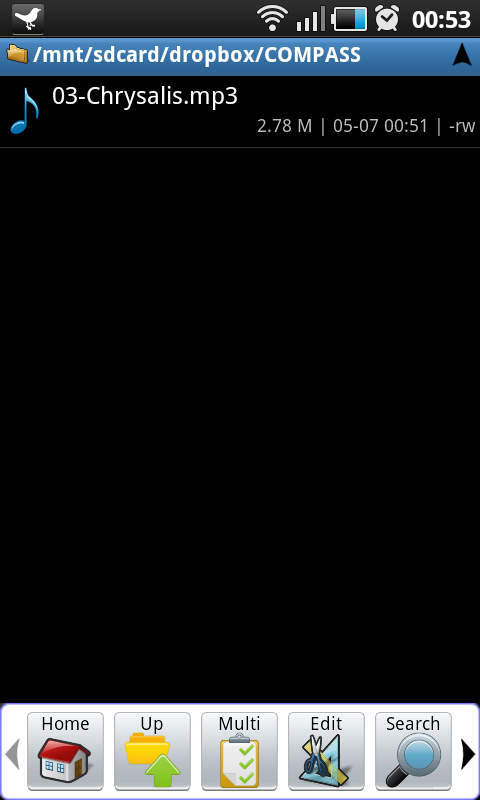 In general, some of the Android apps appear to take longer time to load while users are kept waiting with blank screens. I felt that the iPhone offers me faster speed when seeking information, moving from app to app, screen to screen. The fact that I can check-in to Foursquare using iPhone at half the time I require using my Android phone makes me want to check-in more frequently than with Android. Again, performance may vary for different Android phone models. That’s all you get for notification on iPhone. This is where the Android OS shines. All the incoming activities are presented on the status bar, and when you pull down the status bar, you are presented with the list of notification items that needs your attention (some even comes with message preview). Click on the items to access the app and the updated information is presented on the screen immediately. There is no need to wait for the information to download. This is possible because Android supports true multi-tasking, allowing your apps to continuously receive feeds. And Android users have a notification screen to help them keep track of what he or she has missed without having to scroll all the app icons to find them. 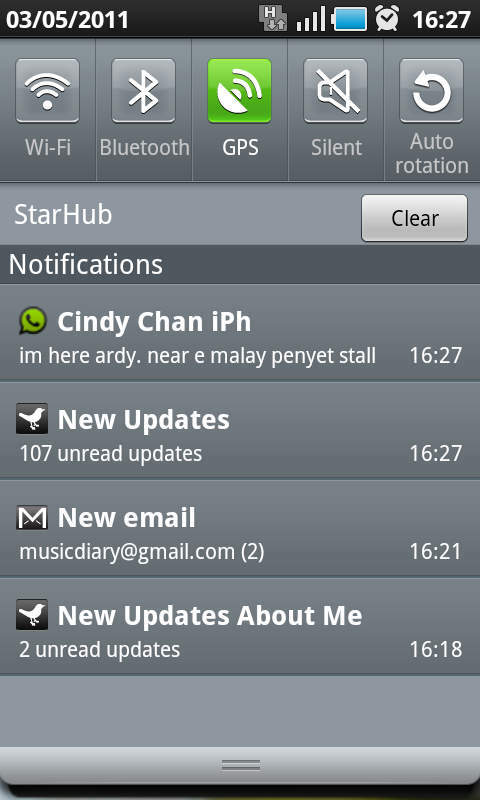 Android: Whatever notification you have received from the apps will be listed here. Let me use TweetDeck app as an illustration to compare how the same app works on the two OSes. 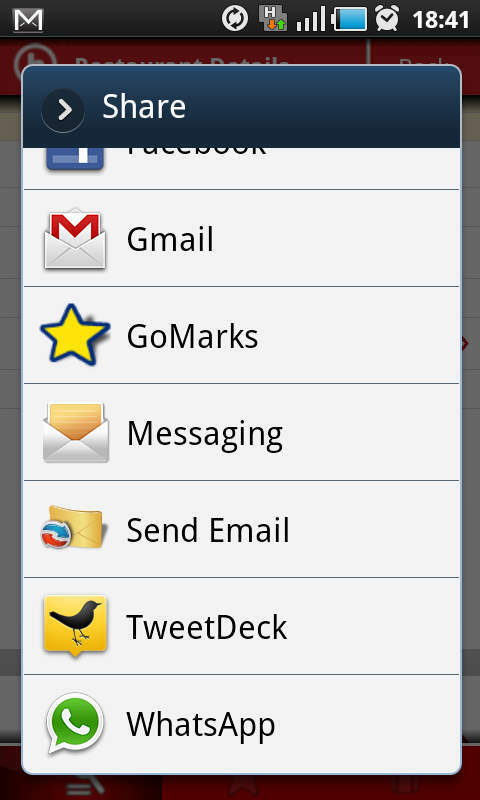 On Android, the moment I start the app, TweetDeck starts to retrieve unread feeds. I can press the home screen any time and run other apps while TweetDeck continues downloading unread feeds. Once the download is complete, I will receive a notification on the status bar. Notification settings are customisable to a rather granular level: I can define which feed columns I want to be notified, and I can choose how I want to be notified – sound, vibrate, light, status, or all. On the iPhone, once I open the app, I have to keep TweetDeck on the foreground and wait for the app to retrieve unread feeds. If I press the home screen anytime, the download will stop. Worse, if I were posting a tweet, I have to wait for the post to be successful before closing the app, or else the tweet may not be posted. Some apps (like Facebook) may support push notifications in the form of badges as mentioned earlier, but you still need to open the app before the download of the actual information commences. 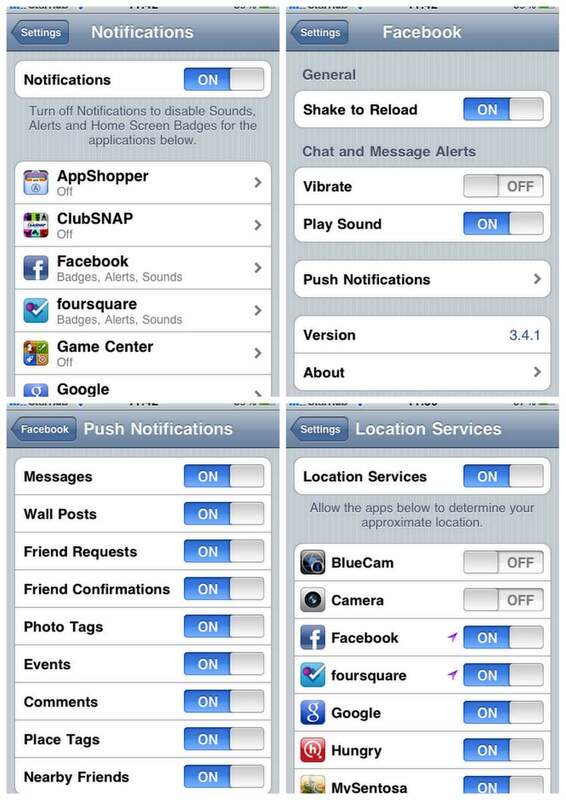 Interestingly, notification settings for iPhone apps may have to be configured in several different screens! One screen is under Phone Settings app (e.g. Facebook), another is Phone Settings -> Notification (yes, Facebook has one there too), the third is Phone Settings -> Location Services (you may need to enable this so that iPhone knows where you are and determine whether you need to receive notification) and the last one is within the app itself (e.g. Foursquare has one there, but not Facebook). In other words, there is no consistent design to configure app settings. For Android, app settings are generally achieved by pressing the hardware “menu” button and then “Settings” button. Then there is a global setting which controls whether the Android phone can allow running of background data for all apps. And that’s it. It is true that apps running in the background consumes battery faster, but you also have a choice not to keep it running in the background. For some apps like TweetDeck, just exit the app and notification will stop. However, some poorly-written apps may still continue to run in the background even after you exited the app and the only way to prevent notification is to uninstall the app. I do find myself doing that for some Android apps because I have no way to stop them from downloading data in the background and triggering notification which annoys me and uses up data bandwidth, not to mention battery life. To summarise: iPhone allows the user to quickly execute activities without missing a beat. I find myself opening TweetDeck web links, uploading Twitter photos much quicker than using Android (speed difference may vary depending on Android phone model). But Android allows TweetDeck to run in the background, notifies me regularly on new feeds, and downloads them at the same time, so I can read them in an instant. Android also provides a notification screen to display notifications from all other apps that are running in the background, even when I am using other apps. The only way to transfer files to and from iPhone is via iTunes. The only way to download full-resolution camera photos, videos and screenshot is via USB connection to a desktop computer. Photo and music albums synced via iTunes can never be moved or deleted from iPhone. When you take a photo or a video or capture a screenshot, iPhone stores them in a common location. When you use third party apps to download files (e.g. Dropbox, Instagram), these files are either stored in the common location (i.e. Photos) or within the app folder, which can only be transferred in/out via iTunes. You do not have to worry about specifying a folder to store them, nor will the files be “lost” in the iPhone because you forgot where you saved the files. So, little wonder why you have limited options about using, manipulating, sharing, or even saving a piece of information or file. In short, the data can only be used either by a set of apps dictated by Apple or used exclusively within the app itself. On the Android, you have greater control of how you want to manage the data or file. With every app you run, the data or file generated from the app is stored within a folder that is accessible using file browser app. You can easily rename, copy, move, delete the files. Your photo and music albums are merely files stored in folders and read by the Android photo and music apps to present them in an interface for your consumption. The drawback of this “freedom of management” is that these files may be scattered in different folders. Say, you have many camera apps on your Android. The photos you captured using each app are stored in their different app folders. If you want to view all the photos, you have to navigate to the respective folders – if you know where to find them. On the iPhone, all photos captured by any camera app can be found in the “Camera Roll” of the Photo app, because that is where they have to be stored. How convenient! But convenience has its price. Just like choosing a car with an auto gearbox vs. manual gearbox. Here’s an illustration using HungryGoWhere app. On the iPhone, clicking the “Share” button offers me only one option: launch Mail app to share. The list grows depending on the number of supported apps you installed in Android. 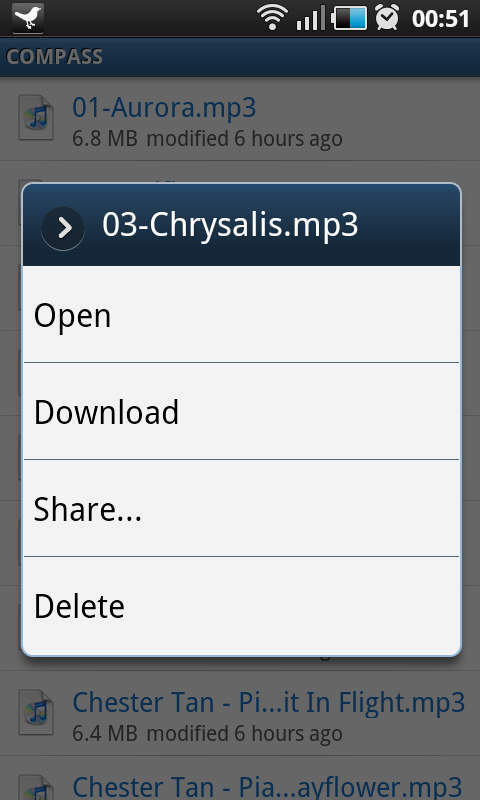 If you choose to download the file, the download activity will be displayed on the notification screen (as per the usual Android fashion), which means you can proceed to switch to other apps and be notified once the download is completed. And as mentioned earlier, the drawback is that this file is stored somewhere in Android, so if you want to copy this file out of Android, you have to use the file browser to locate it – well at least you CAN do more with this file than sharing a link via iPhone. 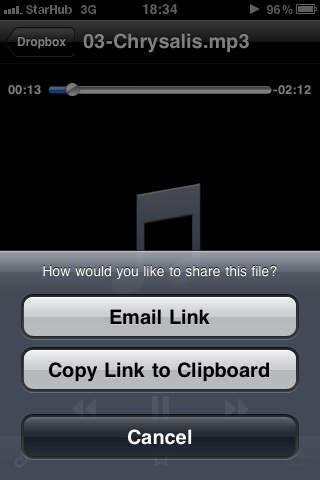 To summarise: iPhone offers a common repository for any multimedia files you create – images, video, music. Each third-party app can also manage their respective files in folders within the app, which cannot be shared with other third-party apps except Apple’s. The benefit of such control is that the user would not face a challenge of managing and tracking these files. It is actually very convenient for most consumers, but not for the tech-savvy ones. Just like driving a car with a manual gearbox, the Android offers the user complete control over the management of user-generated files without depending on the source app. So, once the content is created by one app, the content can be used by another other app within Android. At the end of the day, there is no right or wrong to your choice of phone. What usually happens over the course of using any device is that we learn to adapt and work around the limitations. The iPhone and Android OSes are both excellent in their own merits. Personally, I am very comfortable using either interfaces, barring some inconveniences. Android is the preferred device for managing vast amount of real-time information received (where the multi-task feature notification screen helps me to keep track effectively) and a flexible platform for me to manage and use my files without restrictions. The drawback would be occasional device lags and freezes, so a little patience is necessary. iPhone is a better device for entertainment, for updating social media statuses swiftly, for playing games. The device is generally very stable (even if the apps crash, there is no techie messages that might cause user panic – the app simply auto closes). The limitation would be the inability to have control over the file management and requiring you to manage files over iTunes. My major concern on using iPhone as a business phone is the lack of notification framework to allow me to track incoming messages, push mails, social media updates. Perhaps the next phone OS update from both companies could incorporate the better features from each other. 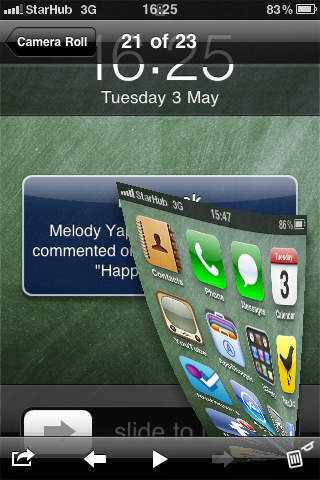 A multi-tasking iPhone 5 with better notification feature? An Android that runs apps more smoothly and speedily? We can only look forward to the future! Thanks for your feedback! I've tweaked the article to indicate that performance may vary with different Android phone models. Cheers!